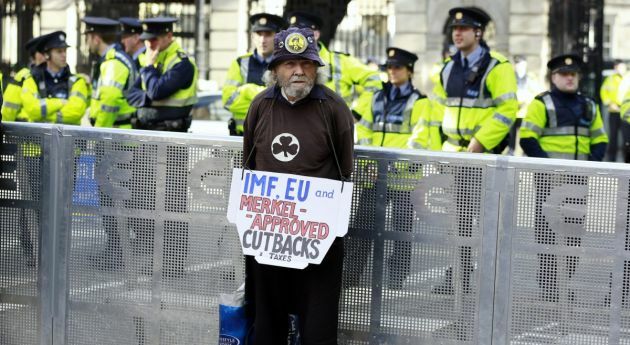 (Photo: REUTERS / CATHAL MCNAUGHTON)A man demonstrates in front of Leinster House as Ireland's Finance Minister Michael Noonan presents the budget to parliament in Dublin October 15, 2013. The Greek financial crisis strikes fear in Europe and the world it will trigger a contagion that could upset the global economy along with anger from people in the stricken nation that they are being humiliated. Pope Francis said July 1 expressed his closeness to the Greek people who are suffering the effects of the current crisis, the Holy See Press Office said. European officials have said no to further negotiations with Greece before a national referendum planned for July 5, noting that the Athens government's vote holds peril for the country no matter which option Greeks choose. Francis described the news from Greece "regarding the economic and social situation of the country as worrying." He said he "conveys his closeness to all the Greek people, with a special thought for the many families gravely beset by such a complex and keenly felt human and social crisis." "The dignity of the human person must remain at the center of any political and technical debate, as well as in the taking of responsible decisions" the Pope noted. He invited all the faithful to "unite in prayer for the good of the beloved Greek people." Many Greeks have said that that the European Union's insistence that Greece must show fiscal responsibility is humiliating at this time and imposes inhumane constraints that prevent a recovery mode. They say austerity is punitive and not remedial and that Germany and itnernational financial institutions such as the International Moneatary Fund are setting the agenda with harsh demands on Greece. European negotiators have argued that other countries using the euro currency such as Ireland, Spain and Portugal have overcome their own debt threats, containing them by being responsible, frugal and taking the necessary steps to deal with their woes. Greece imposed capital controls June 29 to prevent a run in banks leaving Greek banks empty and the population deeply dived on how to counter the crisis. The July 5 referendum on whether to accept creditor demands in return for rescue loans may not resolve any of the country's economic woes or uncertainties. Greek banks must remain shut for at least one week and no person may withdraw more than 60 euros ($67) a day. Greek Orthodox Church Archbishop Ieronymos appealed for calm after concerns about the effect of public rallies the referendum brining about further divisions among voters, The Associated Press reported. Ieronymos said July 1, "We must not let the poison of division touch our hearts ... It would be a crime commit against future generations." The World Evangelical Alliance said it received a call to prayer from the Greek Evangelical Alliance, its national member body. "People in Greece are apprehensive and worrying as the overall situation is extremely difficult, creating tension and confusion even among believers. "Our small evangelical community does not take sides in political matters, as this could bring about divisions in the body of Christ. The overwhelming majority agrees that the future of Greece is in the Eurozone," the Greek Evangelical Alliance said. "Pray as the evangelical churches try to be agents of hope offering acts of mercy to people in need. Pray for unity among believers in Greece... we do not want the political referendum to create conflicts among Greek people and especially among churches and believers. "Pray for God's mercy upon the nation of Greece and for wisdom among the people and government officials," the Greek Evangelicals said.